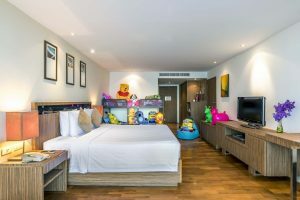 Novotel Hua Hin Cha Am Beach Resort and Spa is a perfect Hua Hin Family Resort for a fun-filled holiday in Hua Hin. This award-winning family beachfront resort offers guest modern rooms and suites. Each one features a private balcony and stunning panoramic sea view of the Gulf of Thailand. This Hua Hin Family Resort boasts of 7 rooms types, from Standard Rooms to penthouse. 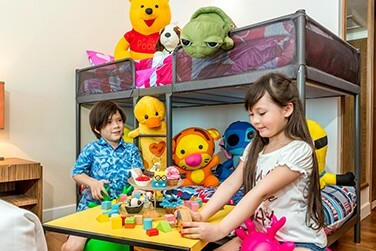 The Family Fun Rooms provide King bed and bunk beds, set up with kids amenities and toys. Pamper yourself at In Balance Spa or keep in shape at In Balance Fitness while your kids enjoy Kid’s World‘s activities. Such as bouncy castle, trampoline and more. The resort features 7 bars and restaurants serving Asian and international dishes. 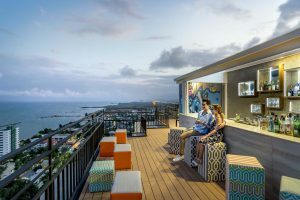 Don’t miss Gravity Sky Bar, the newly opened 360-degree rooftop bar located on the 24th floor of the resort. 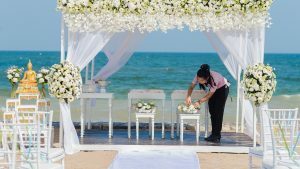 This resort in Hua Hin is conveniently located between Hua Hin and Cha Am beach, only 2.30-hour drive from Bangkok and a 15-minute drive from Hua Hin City Center. Don’t miss to visit the surrounding attractions such as night markets, water parks, and golf courses. 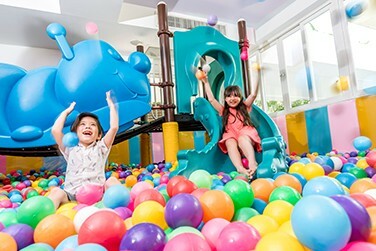 Stay at Novotel Hua Hin Cha Am Beach Resort and spa to enjoy a large range of family activities. The large swimming pool includes a water slide and a swim-up bar. Kids and parents can choose from mini-golf,’ walk-on-water activity, pool volleyball, bike rental, nail painting and much more. Also, the resort also offers great family deals on food an beverages. A special Kids menu is available at Ocean Terrace Restaurant. Book online to get the best packages and deals. 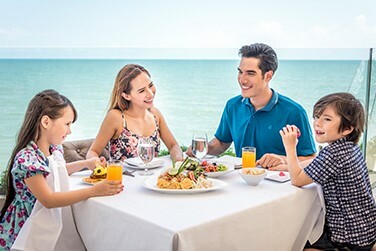 Experience a unforgettable holiday At Novotel Hua Hin, the best family hotel in Hua Hin. Siam Adventure Club features exclusive world-class entertainment and modern amenities for all of guests. Feel welcome with our squad of rangers and Elfie the Elephant welcoming you from your first steps into the resort. During your stay, take advantage of the marvelous Kid’s world. Next, you and your little one will have fun at the modern Arcade Game’s room. Don’t miss to try our WOW Cow – the signature Ice Cream shop. Moreover, you can also buy some souvenirs from the wonderful Toys store inside the property. If you feel adventurous, our Siam Adventure Club Tour desk offers a large range of activities and excursions outside the resort. While parents relax at the spa or do yoga, the children can enjoy the sea and the sun in the swimming pools with water slides. We always have lifeguards for your safety and security. Moreover, the recreation team organizes daily activities at the pool. Such as walk on water, pool boxing and more. Nevertheless, every Tuesday, Thursday, Saturday, and Sunday from 2:00 PM to 3:00 PM we host the family “Foam Party” in the pool. Then you and your family will enjoy dancing, jumping, swimming and playing with bubble in the foam pool. Meeting & Event at Hua Hin Family Resort. The Resort’s Meeting and Events facilities are outstanding with 850 sqm of function space. The main ballroom can accommodate up to 450 people. A Hua Hin resort offering state of the art Hua Hin Meeting Venues with flexible and adaptable meeting rooms. Moreover, Novotel Hua Hin Cha Am is capable of meetings for up to 400 delegates. Furthermore, with a specialised catering and event team, the hotel is able to adapt to your events needs and requirements. Hotel has a customised menus, theming and venues. For example, sit down meeting, gala banquet dinner or a outdoor cocktail party.